A Letter of Guarantee refers to a written commitment granted by a bankTop Banks in the USAAccording to the US Federal Deposit Insurance Corporation, there were 6,799 FDIC-insured commercial banks in the USA as of February 2014. The country's central bank is the Federal Reserve Bank, which came into existence after the passage of the Federal Reserve Act in 1913 on the request of a client who has engaged a sale agreementSale and Purchase AgreementThe Sale and Purchase Agreement (SPA) represents the outcome of key commercial and pricing negotiations. In essence, it sets out the agreed elements of the deal, includes a number of important protections to all the parties involved and provides the legal framework to complete the sale of a property. to purchase goods from a supplier, providing assurance that the customer will fulfill the obligations of the contract entered into with the supplier. Apart from the purchase of goods, a letter of guarantee may also be issued in technology trade, contracting and construction, financing from a financial institution, large equipment leasesEquipment Lease AgreementEquipment lease agreement is a contractual agreement where the lessor, who is the owner of the equipment, allows the lessee to use the equipment for a specified period in exchange for periodic payments. The subject of the lease maybe vehicles, factory machine or any other equipment. Once the lessor and lessee agree and goods import-export declaration. It may also be issued if requested by a call writer to give a guarantee that they own the underlying asset and that it will be delivered by the bank if the call is exercised. When is a Letter of Guarantee Required? A customer will often provide a new supplier with a letter of guarantee because the new supplier does not have a history of transactions with the customer and therefore, there exists a lot of uncertainty between the two parties. The practice is most common when the customer wants to purchase costly machinery and equipment, and the supplier does not want to provide trade creditTrade CreditA trade credit is an agreement or understanding between agents engaged in business with each other that allows the exchange of goods and services without any immediate exchange of money. When the seller of goods or service allows the buyer to pay for the goods or service at a later date. Early-stage companies may not have enough liquidity to finance the purchase of goods at the start, and they may ask the bank to provide a letter of guarantee when purchasing such goods. Also, since they do not have a credit history with the supplier, it would be impossible for the supplier to judge the company’s ability to pay. Companies that do business overseas may be required to provide a letter of guarantee by suppliers to show their commitment to pay for the products. This is because suppliers may incur additional costs in supplying goods outside the country and they want a guarantee from a bank that they will receive the payments when the customer fails to pay. A company may request a letter of guarantee from the bank when a supplier asks for one or is uncertain of the company’s ability to pay for goods supplied. A bank follows the following process when issuing the guarantee letter. When a bank receives an application for a letter of guarantee, it must determine whether the customer qualifies for the same. It does this by scrutinizing the underlying transaction, history of transactions, and other relevant materials. The bank may request for additional information or documentation from the customer if needed. Fees are determined using the principles and rates as stated by the regulations of the issuing bank. Before the bank issues the letter of guarantee, it may be amended if requested by either the customer being guaranteed or the beneficiary. The subject of the amendments may be the underlying asset, validity period, etc. After the supplier has provided the goods to the customer and has made claims for compensation from the guaranteeing bank within the validity period, the bank shall notify the customer of the request. The bank will then examine the claim documents and certify that they comply with the claim clauses of the letter of guarantee. If the bank is satisfied with the claim, it makes the payments to the supplier for an amount equal to the amount of work performed. After the bank has made the payments to the supplier, it updates the customer’s records to reflect the changes. The bank also stores the letter of guarantee and verifies that they reflect the actual transactions. After the bank confirms relief from the guarantee letter of guarantee liability, it revokes the guarantee and recovers the credit line from the customer, or if there is a surplus, it refunds the customer. Assume that ABC Company is a manufacturer and supplier of steel in the state of California. XYZ, a construction company, has been a regular customer of ABC and has landed a new contract to build the Cyprus City Project that is projected to cost $6.8 billion. XYZ company has requested ABC to supply them with $500 million worth of steel in Cyprus, Europe, at the construction site. However, since Europe is outside of ABC’s area of trade, it wants XYZ to provide them with a letter of guarantee before they commence the contract. XYZ approaches M&N Bank to provide a letter of guarantee so that the supplier can start supplying the materials on the site. The bank confirms whether XYZ qualifies for the guarantee letter, and once satisfied, it proceeds with the issuance of the legal document for $500 million with a validity of 180 days to ABC Company. Upon receipt of the letter of guarantee, ABC proceeds to supply the steel to the construction site in Cyprus. If XYZ fails to pay for the steel, then ABC has the right to claim for compensation from M&N Bank within 180 days for an amount equal to the value provided for in the guarantee letter. A letter of credit and a letter of guarantee have a lot of similarities, but they mean two different things. A letter of credit, also known as a documentary credit, acts as a promissory note from a financial institution and it represents an obligation on the side of the bank to make payments once certain terms have been met. Once the bank confirms that the terms are completed and verified, it transfers the funds to the executor of the terms. The letter of credit is backed by collateral or credit from the customer. On the other hand, a letter of guarantee is similar to a letter of credit but with one distinction – it pays either the seller or buyer if the other does not fulfill the transaction’s requirements. 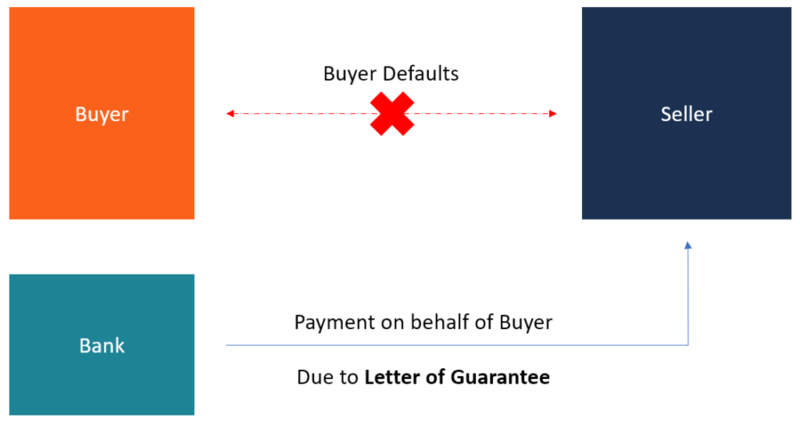 For example, if the supplier asks the buyer for a letter of guarantee, but the buyer defaults on payments, the seller has the right to claim for compensation from the bank. Similarly, if a buyer is required to pay for shipment before delivery and had asked the supplier for a letter of guarantee, the buyer may claim for compensation from the issuing bank if the goods paid for are not delivered.